Are you preparing to take a vacation in the next few weeks? 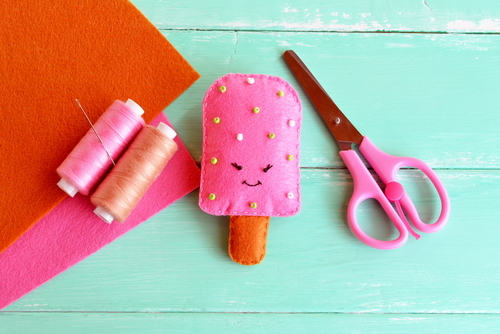 There’s no better way to prepare for your trip than by producing some cool DIY sewing creations to accessorize your travel items. These projects aren’t too difficult but it’s important to carefully follow the instructions so you don’t screw up! With the help of Fabricville’s products, here are three inspirational sewing projects you can tackle to prepare for your holiday. It can be really hard to differentiate your luggage at the airport, especially if you’ve got the same generic black suitcase as everyone else in the terminal. The best way to identify your baggage is to have a unique and personalized luggage tag, meaning you’ll be able to spot it immediately on the conveyor belt. According to SewSomeStuff.com, you can download a sewing template directly from the site, which offers step-by-step directions. You typically have to print out the design shape on some plain paper and use it to trace the contour of the fabric. Just follow the simple steps in this video and your DIY luggage tag will be done in no time. We also recommend choosing fabrics that showcase some funky colours and patterns. Check out our vast collection of fabrics on our website. We hope you’ll enjoy your summer vacation and remember to pick up some materials at Fabricville for your next sewing creation. So remember before you leave for your holiday, craft these cool DIY items and let your creativity flow through your fingertips.